Mr. President, FORUM-ASIA welcomes the report of the Office of the High Commissioner for Human Rights (OHCHR) on Sri Lanka. We share the High Commissioner’s concerns at the lack of tangible progress and genuine political commitment to implement the Sri Lankan Government’s commitments under resolution 30/1. Today, for more than two years, many Tamil families of the disappeared have been at roadside protests demanding to know what happened to their loved ones. The inability to demonstrate progress in searching for the disappeared had led to them expressing disappointment and lack of confidence in the Government and the Office of the Missing Persons (OMP) – the only one of the four promised transitional justice mechanisms operational so far. Without a credible judicial mechanism to establish criminal accountability for grave international crimes allegedly committed in Sri Lanka, any attempt at transitional justice and reconciliation will ring hollow. The government backtracking on the commitment to establish a judicial mechanism with international involvement is particularly concerning. Member states must consider seriously the High Commissioner’s recommendation to use universal jurisdiction principles and explore other options to advance accountability in the absence of credible domestic processes. 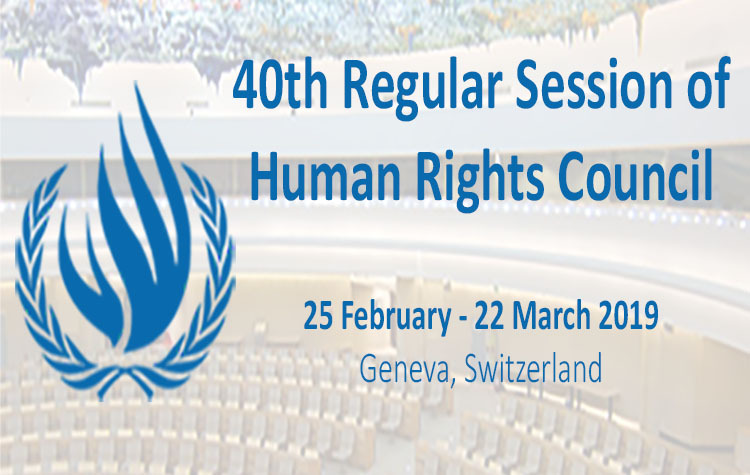 Despite some improvements in the human rights situation, assaults, threats, harassment and surveillance of human rights defenders, lawyers, journalists and those cooperating with the UN have persisted. Fears of further repression are exacerbated by the Government’s attempts to introduce new repressive measures through the proposed Counter Terrorism Act (CTA) to replace the existing Prevention of Terrorism Act (PTA). The Government must demonstrate its sincerity in implementing commitments to protect and promote human rights by repealing the PTA and withdrawing the CTA. Establishing credibility and public confidence in the transitional justice process requires a concrete, transparent and time-bound action plan for the implementation of the commitments. We call on Sri Lanka to develop such a plan in collaboration with OHCHR. The drawbacks to the transitional justice agenda during and after the Constitutional crisis in late 2018, indicates the fragility of the state’s commitments and the need for continued international engagement in Sri Lanka. Given failures and slow progress, the Council must step up the engagement through measures such as an OHCHR field office, a Special Rapporteur and an independent international mechanism to gather and preserve evidence to assist the accountability process. Many survivors of violations, victim families and affected communities have lost faith in the Council and others are fast losing faith. The Council must not let them down. Thank you.